The newly-discovered alien world Qatar-1b orbits an orange type K star 550 light-years from Earth. Qatar-1b is a gas giant 20 percent larger than Jupiter in diameter and 10 percent more massive. It circles its star once every 1.4 days, meaning that its year is just 34 hours long. 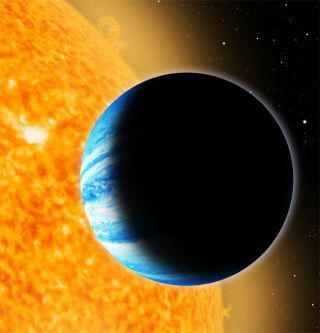 A newgas giant alien planet was discovered by an international team led by anastronomer from the Arab nation of Qatar. Thefind represents a significant success for Qatar's science research program, anddemonstrates the power of science to cross political boundaries and increaseties between nations, the study's leaders said in a statement. "The discovery of Qatar-1b is a great achievement --one that further demonstrates Qatar?s commitment to becoming a leader ininnovative science and research," said Khalid Al Subai, leader of theQatar exoplanet survey and a research director of the Qatar Foundation forEducation, Science and Community Development. "This discovery marks thebeginning of a new era of collaborative astrophysics research between Qatar,the United Kingdom and the United States," he added. Subai teamed with scientists at the Harvard-SmithsonianCenter for Astrophysics (CfA) in Cambridge, Mass., and other institution tomake the discovery. The Qatar exoplanet survey is an ongoing project that huntsfor stars that "wink," dimming slightly every time an orbiting planetcreates a mini-eclipse by crossing in front of the star as seen from Earth. Transitsearches like this must sift through thousands of stars to find the smallfraction with detectable planets. "The discovery of Qatar-1b is a wonderful example ofhow science and modern communications can erase international borders and timezones," said CfA team member David Latham. "No one owns the stars. Wecan all be inspired by the discovery of distant worlds." To find the new world, Qatar?s wide-angle cameras (locatedin New Mexico) took images of the sky every clear night beginning in early2010. The photographs then were transmitted to the United Kingdom for analysisby collaborating astronomers at St. Andrews and Leicester Universities andQatar. That analysis narrowed the field to a few hundred candidate stars. The researchers then followed up on the most promisingcandidates, making spectroscopic observations with the 60-inch-diametertelescope at the Smithsonian's Whipple Observatory in Arizona. Suchobservations can weed out binary-star systems with grazing eclipses, whichmimic planetary transits. They also measured the stars' dimming more accuratelywith Whipple's 48-inch telescope. Qatar-1b is a gas giant 20 percent larger than Jupiter indiameter and 10 percent more massive. It belongs to the hotJupiter family because it orbits 2.2 million miles from its star -- onlysix stellar radii away. The planet roasts at a temperature of around 2,000 degreesFahrenheit (1,100 degrees Celsius). Qatar-1b circles its star once every 1.4 days, meaning thatits year is just 34 hours long. It?s expected to be tidally locked with thestar, so one side of the planet always faces the star. As a result, the planetspins on its axis once every 34 hours -- three times slower than Jupiter, whichrotates once in 10 hours. A paper announcing the discovery has been submitted to theMonthly Notices of the Royal Astronomical Society for publication. POLL: When Will Humanity Truly Find an Alien Earth?